If you aren't following me on Instagram already you definitely should if only for this month! Every day this month in honor of Native American Heritage Month, I am dedicating time in my Instagram stories to learning about a Tribal nation. These are fun mini-lessons that I get to share with my followers, and will also be sharing a few of them here on the powwows website. Today's Mini-lesson is on one of my nations! Mohawk Nation. This flag above is actually representative of the Haudenosaunee. A Confederacy of 6 nations. The Haudenosaunee occupied the are in the map below and up into Canada, and parts of Wisconsin. The Mohawk nation extends up into Canada because borders are a colonial construction. So let's talk a little about the culture. Wampum beads are used to create patterns and designs and woven together with string. Belts narrate traditional stories and are made from Quahog shells. Each image on the wampum belt represents an important part of Haudenosaunee culture, which includes the Mohawk people. Traditional foods for the Mohawk people revolve around what we call the Three Sisters. Squash, corn, and beans. These were planted together to encourage each other's growth. These foods were often cooked together for meals like Succotash or corn soup. Maple syrup and berries are used as sweetening ingredients. Other foods were gathered while out, things like wild potato, acorns, and chestnuts. Often times the nuts would be used in bread. Mohawk people lived in and had ceremony in longhouses. These were made from bark and very durable. Some of the larger homes would measure 200 ft long and 18ft wide. There were no windows, only holes cut in the roof for smoke to escape. Wooden screens would separate individual family areas, with the whole house accommodating a larger clan family unit under a common female ancestor. Mohawk men might best be known for their hairstyle. This hairstyle is maintained by physically plucking the hair from the head, traditionally this was a permanent method to reduce hair to maintain the look. The style was in direct defiance to Europeans and their desire to scalp natives. 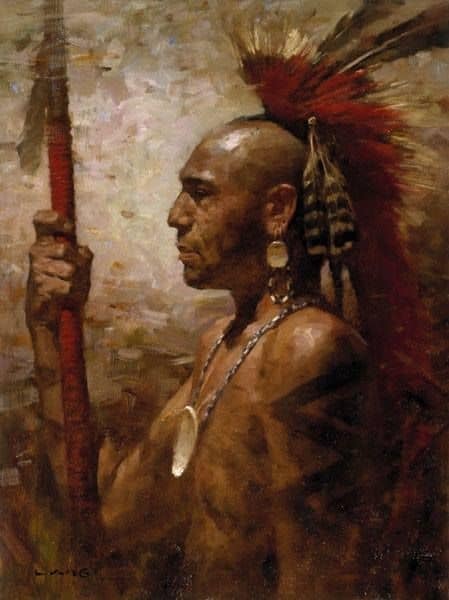 It was done to make their scalps more desirable so that Europeans would leave the women and children alone and come for them instead, and they were ready. If you want to support a Mohawk small business, I encourage everyone to check out Sapling and Flint. They are owned by two Mohawk sisters and their work is amazing. I even have a discount code with them. Enter “corinne19” when you check out to get 10% off from them! That concludes today's mini-lesson! I hope you learned something new. Corinne Oestreich (Mohawk/Lakota) has been a writer with powwows.com since 2014. She lives in the state of CA, and enjoys attending and photographing many of the Northern CA powwows and events. She owns her own photography business and is also a Fellow with Changemaker Initiative in partnership with Ashoka.